Today we are rolling up our sleeves, and putting a real shift in so that we can put together this Dunster House review to help you folks get a better idea about what kind of retailer they are. They are a company who really do sell it all as they have more standard garden structures like sheds, summerhouses and playhouses, but they also sell more out there things like outdoor gyms and hot tubs. Dunster House is a very interesting retailer and by the end of this review you will know exactly if they are the retailer for you. Dunster House have been in business since 1994 and they sell thousands of garden structures each year. They are one of the most hands on garden retailers out there as they not only have their own manufacturing plant, but they also handle all orders themselves and take care of delivery as well. 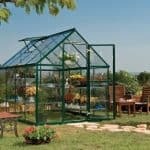 Interestingly the company as well as garden products they also deal in doors and windows. While working on this Dunster House review there were many things that impressed us and the amount of different products that they have was one of the things we really liked. They have many different categories such as sheds, greenhouses, summerhouses, log cabins and climbing frames to name a few. That last one is very interesting as they are the only UK retailer who specialise in monkey bars on their play frames which is something we think is great and it certainly gives them an edge over the competition when it comes to their kids outdoor play structures. It also gives you the chance to show the kids how cool you are by demonstrating how you can try the monkey bars and then fall flat on your face. Another series of products that they have here which impressed us was their range of garages, as they have some truly large and impressive ones that look unlike any we have seen before. We found that their selection of sheds, summerhouses and other structures have a great look to them and this is because they use strong and gorgeous looking cedar wood. While we really liked looking through their sheds, summerhouses, greenhouses and other more traditional garden structures (which by the way have this very strong and great look to the them thanks to the cedar wood and fantastic design), one thing we really liked was the vast amount of other types of garden products. For those looking to finish off their garden with a bit of style, you are going to love their range of pergolas, arbours, gazebos and shelters. They also have some more out there and rather odd things which we do not mean as a bad thing. They have an outdoor bar, hot tub, gym equipment and even and old style candy machine! Honestly, the selection of products available here could easily have a whole review dedicated to just them as there are that many to talk about. One thing we are really excited to see is their pressure treated log cabin that they have in the works which will be the first one available in the UK. 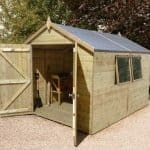 If you want something that is more than just four pieces of wood with a roof to throw your tools or the kids bike in, then this is a site you have to look at, as the sheds they offer just have so much personality and style to them that they really will be a fantastic feature of your garden. We are sure this is the part of the Dunster House review that many of you have come to once you saw how gorgeous some of those products are. At first glance we are sure that some of you may think the products here are priced a little highly, but actually we feel that these are products that are incredibly well made and honestly we are quite blown away with the attention to detail that their products have. Of course when you have this level of detail, you are going to have pay for it and honestly we have no problem with this at all when the quality is so high. Most of the products here are high end, let’s look at their summerhouses for example. Most of the summerhouses here are high end summerhouses and cost close to or way over £1000. Many of them come in a standard form, but if you want to pay a little bit more you can upgrade to their premium or premium plus range. Doing this will add numerous features that not only enhance the look, but also help the overall quality and longevity such as improved locking and gaskets round the doors and windows to help keep the water out. Dunster House is not just a retailer for people with a lot of money, as even with the high quality and attention to detail that their products have they still have a few more lower cost items as well. 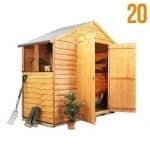 But we have to tell you that high quality is something they are all about so while they do have some lower cost items you are not going to be getting a shed here for £150. 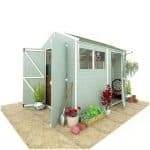 They do have a handful of sheds that are made to the same high standards as the rest of them, but they come in at a lower price such as their Premium Adam II shed which comes in at a very reasonable £574.99. 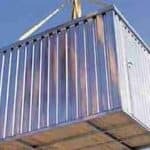 We know this may seem high, but again you are paying that bit extra for a shed that is made to last so we honestly feel that you are getting great value for your money here. 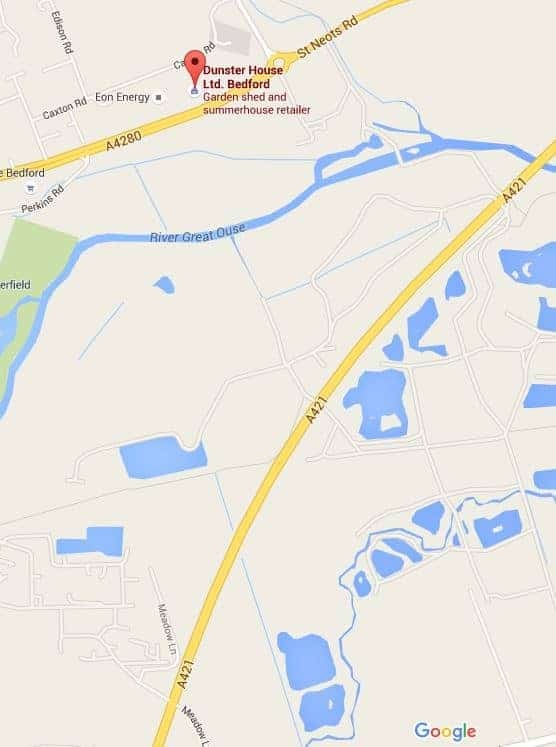 One thing we will say is that if you are after something cheap and cheerful then you will not find that here. The Dunster House homepage is fantastic and when we started our Dunster House review, we knew that talking about using the site was going to be one of the more tricky aspects. Now this is not a site that is hard to use and they have one of the most clear and easy to follow homepages we have seen, but the rest of the site, specifically the product descriptions can be a little bit busy which we will get to in a moment. But let’s talk about the homepage first. The homepage has all their main categories listed right at the top. What is really nice is that when you hover your mouse over one, like sheds for example, it will pop up another section where you can click things like wooden sheds, garages and potting sheds. This will then take you to that section where you can then tinker with the sizes, prices and other such things to help narrow down your search or you can just look through them all and see what stands out to you. 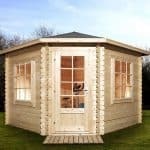 When you click on a product it can be rather daunting, especially if you are looking for your first shed or summerhouse. But actually all the information you could possibly need is listed right here. They break down all the information and list all the dimensions very well and they even give you a little bit of info where they tell you how good the summerhouse, shed or whatever it is you are looking at. We really like the information that they give you, but we just wish it was organised a little bit better. One thing we really wanted to talk about in this Dunster House review was the high quality photos they use to showcase their products. Wow is the best way to describe the way they show off their structures. Most have multiple photos and some even see them get a little fancy with the PhotoShop such as the PremiumPlus Avon Summerhouse which has an African setting with an elephant in the picture. Or our personal favourite, the Premium Severn Summerhouse that has a giant UFO hovering over it! Honestly some of their photos are totally out there and kind of wacky, but we absolutely love it as it really does make you pay attention. Dunster House reviews are a plenty on their site and when you click on a product there is always a little star ranking system about a quarter of the way down the page. You can click this and be taken to a small review section or as they like to call it, case studies. There are a ton of reviews on the site and that is great, but the way they handle their customer reviews is actually very interesting. Let’s take their Thatched Atlas Single Garage, for example. When you look at the description you can see that this has a 5 star ranking and 36 reviews. But when you click this to see the review, you get a small bit of text saying that there are no reviews for this item, but here are some reviews for similar products. Now we think on one hand this is great, but there is always the chance that a customer may miss this and just assume that all 36 of these reviews are for this particular garage. On each product, you can click a link that will take you to a dedicated Dunster House customer review section and this is something that is just a fantastic idea. Once you get to the Dunster House review section you then have many different options at your disposal. You can click on a star and just look at all the 1, 2, 3, 4 or 5 star reviews. By the way most of the reviews on here are for 5 stars, but they do have many 1 and 2 star reviews as well so it is good they are not getting rid of all their negative reviews like it is said some other retailers do. As well as clicking on a star you can actually click a product. So if you want to look at reviews for sheds, click the sheds tab and then you can click a star as well so you can see all the sheds that are rated 5 stars. This is such and interesting and unique way to showcase reviews and we must say, we are very impressed. What Are The People Saying About Dunster House? Here we are going to have a little look at some actual Dunster House customer reviews. There are not as many Dunster House reviews out there as we thought there would be, but we actually did a little detective work and went and had a look round their showroom and as you can tell from our own review we were impressed. Now some of the reviews we saw for this were certainly on the negative side and we are not ignoring these at all and we are sure people have a genuine reason for not being happy, but always remember people are more likely to take the effort to leave a review when something goes wrong rather than when everything goes good. Still there are a very healthy amount of positive reviews for this retailer as you will see below. The sites below are ones that we found to have the best selection of Dunster House reviews and while there are not as many as we would like to see. At least you can get a small idea of what people think Just be sure to have a real good look at the review section on the actual Dunster House site as well. Trust Pilot: Trust Pilot have the largest selection of Dunster House reviews on the internet with over 150 of them. The amount of positive reviews listed here is very nice to see and if you are a potential customer of Dunster House then you will feel much more comfortable in using them after you have seen all the positive reviews here. A phenomenal 71 percent of reviews are for 5 stars. A further 13 percent are for 4 star reviews, so as you can see the majority of customers are very happy. It was great to read so many reviews where customers were happy with not just the quality of the products they have received, but also in the customer service as well. The 1 and 2 star reviews make up just over 10 percent of reviews, which is actually quite impressive. We had a good look over these negative reviews to see what kind of issues people had. The main issue that people have is getting in touch with Dunster House as many people have said that the phone number is for sales only and if you have an issue with something you deal with it through emails. This is quite concerning and we can fully understand just how frustrating this must be for a customer who has had a bad experience. Visit website and see reviews by clicking here. Review Centre: Here there are not as many Dunster House reviews, but the types of reviews that are here are much more mixed than the ones that are listed on Trust Pilot. As of writing there are only 36 reviews. There is not much middle ground here with 14 of the reviews being for 5 stars and 12 of them for 1. As far as the positive reviews go, it is the quality that people seem to be praising as well as the prices. We said in our own Dunster House review how they have many high end items, but you are getting what you pay for and that seems to be the opinion of the positive reviews here as well. As far as the negative reviews go, they all have the same complaint and that is with customer service. People who have had things go wrong say that getting in touch with Dunster House was a bit of a nightmare. Through email seems to be the way that Dunster House like to do things, but that is clearly not enough for people when something goes wrong. Visit website and see reviews by clicking here. Twitter: With most other garden retailers, we feel that Facebook is actually better for seeing customer interaction with a retailer. But actually there is not really much in the way of customer back and forth on their Facebook page, but Twitter is a bit better. Now of course as this is their official Twitter page most of the things posted here are going to be positive, but we think it is great how customers are posting their man caves, sheds, summerhouses and kids play frames for other potential customers to see. So while you are not going to be getting any real Dunster House customer reviews here, it is still worth a look as you can see how some of their products actually look when they are installed in a person’s garden. Visit website and see reviews by clicking here. Well we had a really good look around their showroom and what we saw, we really liked. And from taking a really long and in depth look at their website, we must say that we are still impressed. When we took a really good look at the various customer reviews, we must say that for the most part we are happy with what we were reading, but we do have one concern and that is with people having trouble getting in touch with Dunster House when things go wrong. Again there were not a whole lot of reviews stating this, but still more than enough to make us raise our eyebrows a little bit. Honestly this is a retailer that we have really enjoyed reviewing as we love the way that they show off their different products, but here at WhatShed we like to push retailers to be the best they possibly can so that you the customer gets the best deal and the smoothest transaction possible. And there are a couple of things that we feel Dunster House could do that would make them an even more impressive retailer. The major one is communication with customers. Now granted there are far more positive reviews than there are negative ones, but there are still some people who feel that when they need to get in touch with Dunster House, doing so is far more of a chore than it should be. Perhaps they could have larger more dedicated department who are there to just deal with problems that customers may have. Some of the reviews we read said that they had to call the sales department to vent their frustrations which we feel is of no benefit to the customer or Dunster House themselves. This could be avoided with an actual problems help line. We only have one other suggestion and that is making their product description pages a little less busy. We know this is a personal opinion and some people will be fine with it. We just feel for a person looking to purchase their first shed it may be a little overwhelming trying to take all the information in. We feel that we have been very fair with our Dunster House review and we do see them as a garden building retailer who have a lot to offer. Their selection of products is just fantastic and we love the way they use that cedar wood which makes sure their products are strong and also have a great look to them as well. The amount of positive reviews that we came across were great to see and we do feel that the complaints we read were valid and we do hope that this is something Dunster House will work on in the future. But for the most part this is a retailer we are impressed with and feel they are well worth a look if you are in the market for a great looking garden building. There are not as many Dunster House reviews online as we would like to see, so we would love it if you guys who have ordered from them leave your opinions in the section below. The delivery men unwrap all the untreated timber and pass it to you plank by plank – which can take a good hour – be prepared. As its untreated, and left unwrapped on your drive etc, you must make arrangementst to keep it dry – it will warp etc if wet. In my case, one of the side wall planks was too short my a good few inches so it was not possible to erect the cabin from the timber supplied. Customer services will NOT speak to you, and they only work mon – fri – and take some days to reply. Given I have a crucial piece of missing timber, I’m somewhat dismayed and disgusted that they have still NOT supplied a replacement to allow the erection of a non weather proof cabin. Instead, they blame me, for accepting a delivery that was incorrect. Given that it took 1 hour for two of us to take delivery of each individual plank of wood, and there are hundreds and hundreds, the delivery men cannot wait whilst you count them. Even had they, it wouldn’t have been apparent that one was too short at this stage. The comments about customer service are unfortunately all true. They left me with a huge stack of wood and no instructions at all. The booklet got lost by the delivery guys, and despite them phoning the office, me phoning and emailing the customer service dept, they still haven’t sent me instructions almost two weeks later. They are just ignoring me so I have resulted to making sure I review them wherever possible and let everyone else know how they treat their customers with contempt. Once they have your money they simply don’t care. All they needed to do was email me the instruction booklet and I’d have been happy. The only way they will improve is if people DON’T buy from them. I read some reviews and thought it’d be OK and that they couldn’t really be that bad, but now I just have to try and build with no instructions at all. Please do us all a favor and avoid them like the plague. Shockingly bad customer service, they will only deal in email and will not speak to you in person. My Severn cabin was up 5 weeks and the front collapsed. It was a windy day but it was a yellow warning ie twigs that’s all. My other 6 outbuildings were fine and some are very very old. Dunster will not visit or repair and have told me it’s my problem. I have had a builders report saying it was not installed well and am now having to pursue through the credit card company. Dunsters wash their hands if you once they get their money. Please check the contract, there is no guarantee if something goes wrong. The builder that inspected my building has seen 3 Dunster cabins in a short space of time all with faults. He said they are not good quality. It’s a shame as I really liked my building. I have ordered a cabin from Dunster House and paid in full. I requested instructions to be sent in advance of delivery so I could be prepared and have been told so far that they’re too big to email, they aren’t allowed to do that because someone might copy the instructions and build their own shed and last but not least, they do not have access to them. Staff are very rude on the phone and they have ignored any chance of resolving the issue when I’ve commented on Facebook and instead decided to block me? Very professional. Appalling ‘customer service’, totally unprofessional. They offer no phone customer support, only via email, so I’ve emailed and still waiting for a reply 4 days later. Seems that they like to avoid talking to customers for a reason. Avoid this company, you get what you pay for. I haven’t even received my delivery yet and I’m regretting ever dealing with such amateurs and feel deflated with being treated badly. Purchased my cabin from Dunster House two years ago in 2015. Needed a few missing parts, which took several weeks to sort out through Customer Services not responding. Found the staff to be very rude and unhelpful. They eventually sent out the missing wooden trim for the window frames, to find they were a not quite the same as the existing ones. (Different shape). But Customer Services were not interested in resolving this, insisting it was the same one they had always used. (Not true). Tried contacting Customer Services again this week for something else. Sent an email to ask a general question about the structure/design of their PremiumPlus Severn Log Cabin, to see if I could modify something without it effecting the strength etc. So not related to my purchased cabin necessarily. They refused to give me this information. And kept asking for my order number or post code. When I said this was a general question about one of their products, not specifically related to my purchase, therefore why would they need my order number or post code! I could equally have been a potential new customer asking the same question. Still they would not answer, sending a rude and abrupt reply. Worst Customer Service I have ever come across. Unprofessional and amateur in my opinion..
Avoid at all costs, they are only interested in taking your money. Please avoid this company and deal with them at your peril. We bought a log cabin from them some weeks ago and paid in full. Several of the wood pieces are warped with both ends at opposite directions. 2 of the pieces are too short. Altogether, we have 7 pieces that are not usable. Our log cabin has been constructed half way. Dunster House requested pictures of the items. We have now sent this twice. They claim that they cannot see any damage. We offered to take the items to the local branch where we purchased the log cabin. They would like us to visit Bedford to see someone in Customer Service. Basically, they are not interested in speaking with you, or replacing the items that are not fit for purpose. It looks like this will have to go to court for a resolution as this company is only interested in getting your money off you and offering very little in return. I reported an issue with bowed timbers and a set of photos showing the problem. here is an extract from my email to customer services: Now what I would like to happen is for someone to contact me and discuss the problem we are facing and give me some helpful advice regarding this matter, we went with your company because the you tube videos suggested that you were as professional company who are passionate about constructing quality products using high standards of materials. But at the moment, although I am very happy with my space, I’m thinking you are failing to deliver the standard of customer service that I hoped for. extract from Arlene’s reply: Thank you for your email and photos. Here in Customer Services we are dedicated to dealing with queries quickly and efficiently. As a Company that sells a wide range of technically complex products, we have found that dealing in writing allows us to fully comprehend a query and gives us the ability to consult other departments in order to give you the correct response. This is detailed in our terms of contract and in all of our literature, we are therefore unable to contact you via telephone. there was no follow up or suggestion in writing in the post or email about how to rectify the issue, nor did anyone from the company spare me even 5 – 10 mins on the phone to find out what the issue was despite me sending in very clear photo of how i had to brace the bowed cabin using some timber wedged against a fence. forgot to mention there are no negative reviews on Dunster House facebook page for the simple reason they delete them and block those who post complaints about them.